After having spent four splendid years in the city, I finally left Bengaluru a month and a half ago. I have already created quite a fuss about leaving it behind, ask my parents! The city has left such an indelible mark in my memory that when I think back now—and I suspect it will be the same even years later—there are certain images through which I remember it. 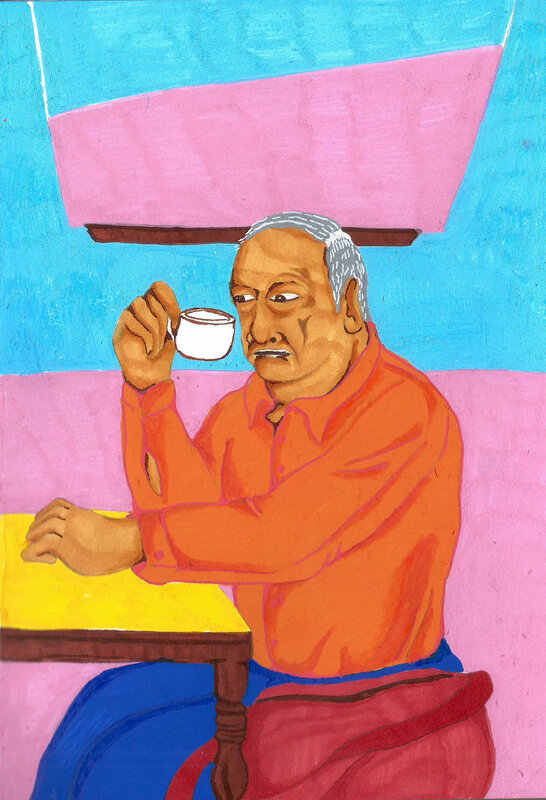 One of the more striking ones is that of old, wrinkly uncles sipping at their coffee in the quaint Indian Coffee House on Church Street. Painted in candy-like hues of pink and blue, Indian Coffee House goes way back in time. With its substantially angled mirrors and poster frames adorning the walls, and slightly yellowing teeth-like plastic switchboards, the place exudes a sense of familiarity and warmth, which can be brought about only by things of the past. And occupying the place is not just the salt and pepper in the cellars on the tables but also on the heads of those perched on the chairs. That being said, I do not mean that the place is not frequented by the younger demographic. It is just the sight of old uncles which is oddly comforting to my eyes. I remember pulling out my journal while sucking noisily onto the last bits of cold coffee to sketch their crinkly skin, their furrowed and dented double chin, along with the mass of flesh that hangs around their earlobes. The visual complexity of their face— the lines, wrinkles, and weight of the skin— is very appealing to draw. Their relatively more peaceful body language (no exaggerated head and hand movements) allowed me to observe them more closely and sketch them in even more detail. They bring a sense of calm with them— no hustle or haste. They are sitting there, making soft, slurping sounds occasionally and reading their newspaper or making conversations. It is a kind of unperturbed composure that is contagious. I have often sat in the coffee house looking around and felt this sense of sedation and quiet overcome me. It reminds me of the smell of freshly cut cucumber for some reason. The grizzled or briskly balding old uncles set a pace – a laid-back one, which mirrors that of Bengaluru as a city. The city appears to be dense and concentrated, but it is easy going. It is not uneventful; it is just unhurried and allows you to be, and to find yourself, like no one is watching. At first, it appears to be impervious with the apparent exclusivity of its local language but it is soft as a watermelon. Just like the presence of old uncles in the coffee house, I find this city to be a reassurance that it is fair to take your own time, have your own experiences and derive your own conclusions. Antra Khurana is an image-maker who revels in the whimsical world of colour and lots of dynamism. She wants to create an impact with her work!